Has Data Guy’s Author Earnings Report finally been laid to rest? It’s been well over a year since the last Author Earnings Report was released by Data Guy, the data analyst who preferred to keep how own identity hidden while making controversial claims about ebook sales in the US book market (and occasionally beyond). In January 2018 the last Author Earnings Report became mired in controversy as Data Guy shifted gear from offering a free service to the self-publishing community to focus on selling questionable data to Corporate Publishing while simultaneously releasing unverified claims about the sales of named indie authors. The latter stunt backfired spectacularly as the indie-author community, hitherto hanging on Data Guy’s every word, lost confidence in the report’s purpose and its numbers. Despite quickly removing the names he’d publicised, citing respect for individual privacy, Data Guy simultaneously remained adamant the sales and earnings of individual authors were not private, and continued to sell this data to corporate publishers, while offering the named authors no right to even know, let alone correct, what was being reported about them. Today Bookstat, the body that Author Earnings morphed into, appears to be still active, but as the data is locked away behind a $10 million paywall and the last update was six months ago it’s hard to be sure. 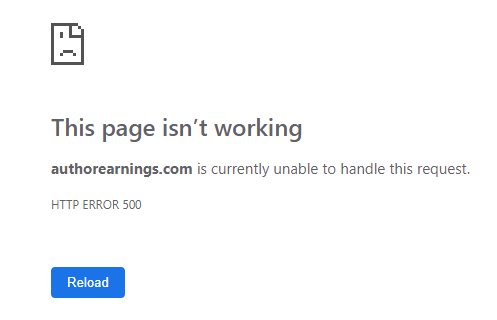 But the Author Earnings Report site has progressed from neglected and gathering cyberdust, comments ignored, promised updates not delivered, to, this past week or two, HTTP Error 500 status. Whether this is just a tech ‘problem being ignored or a convenient way to remove the controversial reports and the mess of contradictory numbers from the public eye – or perhaps the corporate eye of Bookstat subscribers – is anyone’s guess right now. Given the old Author Earnings Reports, claiming to be accurate, were so clearly at odds with the last set of numbers shared from Bookstat in January 2018, also claiming to be accurate, and given the oh-so-casual adjusting of historical data to make the old and new reports look plausible, it would be no surprise if the currently unavailable Author Earnings Report site maintains that status indefinitely. For those curious enough to want to visit the site despite its being offline, the Wayback Machine offers us that option. Just click here.